According to AP, the Butte County authorities have reported 6 additional deaths in a northern part of the state, raising the death toll to 29 and matching the deadliest wildfire on record in California history. According to Reuters, death toll rose to 31. — Forrest Glenn (@ForrestGWoodcox) 11 ноября 2018 г.
Butte County Sheriff Cory Honea also told repoters that 228 people remain missing since the fire began on Thursday. On Saturday, US President Donald Trump said that the disastrous wildfires in California had caused a “catastrophic damage”, adding that 52,000 people have been already evacuated over the calamity. Three major fires are currently raging in California, with the Camp Fire hitting its north, and the Woolsey Fire and the Hill Fire hitting its south. 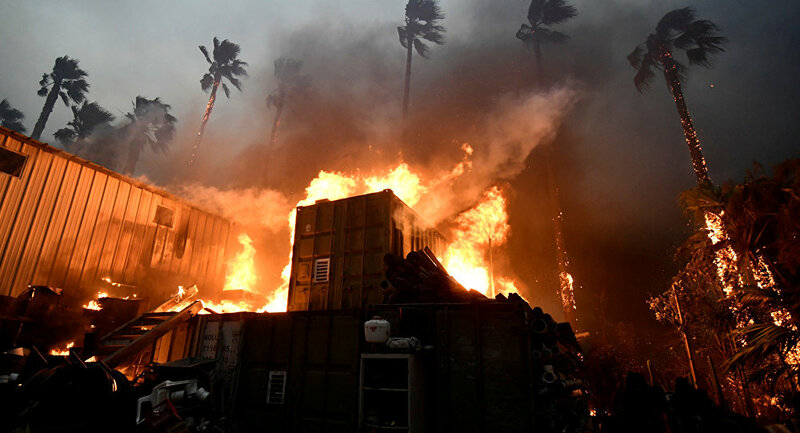 The fire, which started on Thursday and quickly spread across the state, has already destroyed about 7,000 buildings and devastated more than 42,000 hectares of the state's territory. — Photo Geo 🌎 (@PhotoTimeGeo) 11 ноября 2018 г.
Trump has declared a state of emergency in California.